Though it's winter and I'm far far away from places with leopards, zebras and elephants I decided it would be fun to step into that world for a bit. My white elephant candle holder became the centerpiece today. 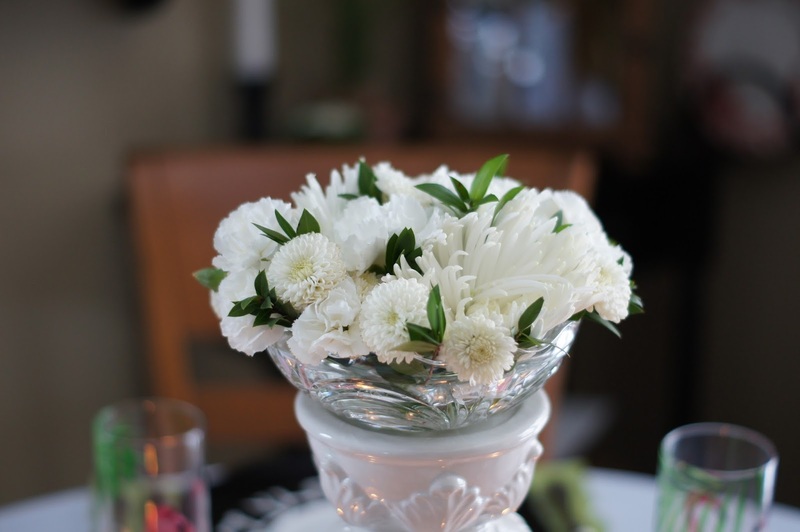 Using snipped off flowers from last weeks bouquet I filled the bottom half of a crystal candy dish to top it off. I wanted a powerful color to go with the animal print plates so the Pink Flamingo glasses were added. I really didn't imagine using these two patterns together but I do like it! Did you know- Flamingos are found in various places including Africa. Here is a" link" about them. 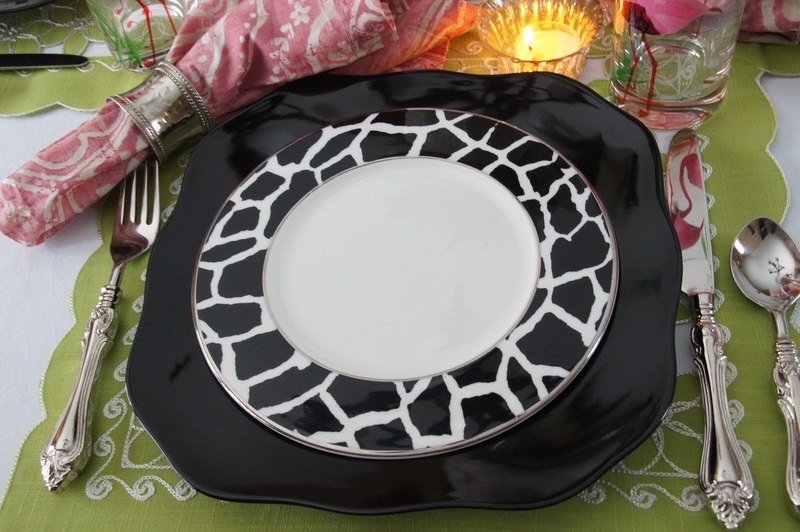 The Mikasa dishes are called "Color Studio Animal Prints"
The bright green placemats (Bed Bath & Beyond several years ago) added a nice pop and I found some pink napkins in my stash to pump up the color! I've always liked animal prints. These dishes came as a boxed set of 4 (discontinued in 2013). The flatware (called Baroque) came from Neiman Marcus a while back. It's fun to think about being in a warmer climate and perhaps some wild adventure too! I always thought going on a safari would be fantastic! For now I'll just have to dream about it! Very cute and wild. I love animal prints. they add some whimsy to the table. 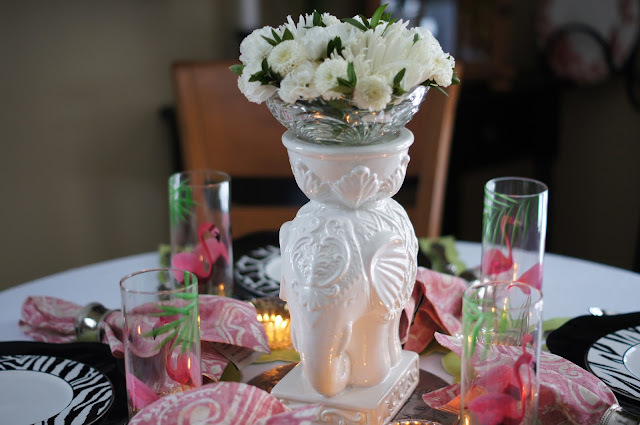 The white elephant centerpiece is so cute! Dreaming about better weather makes sense. 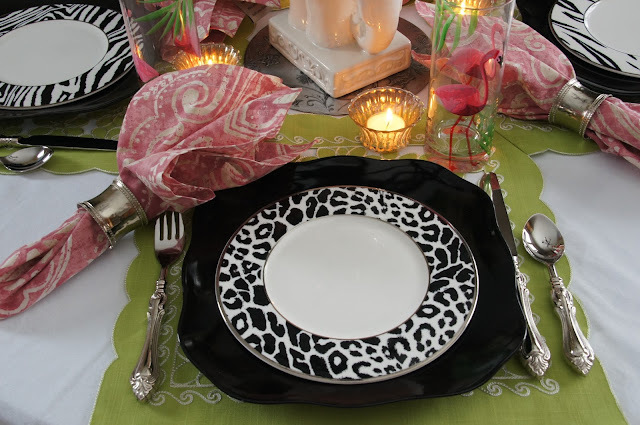 What a fun tablesetting. Love it. Such a fun table. My sister is a flamingo fan. 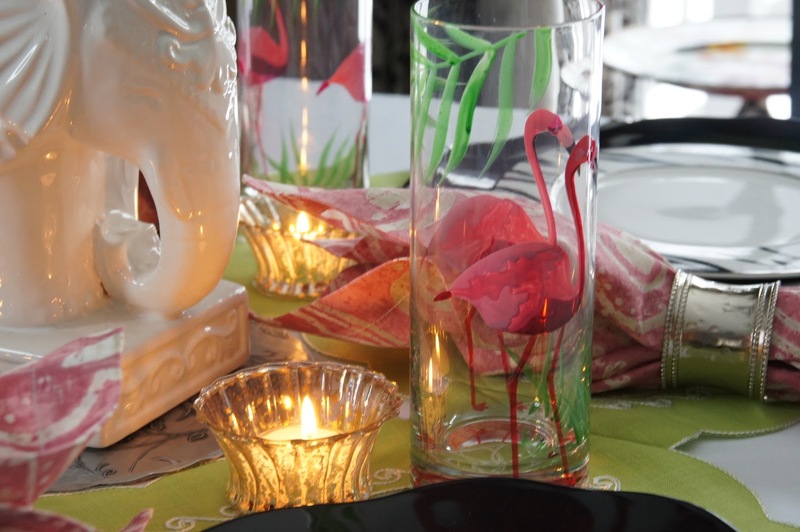 Do you by chance recall where you got your flamingo glasses or what brand they are? This is such a wonderful tablescape! 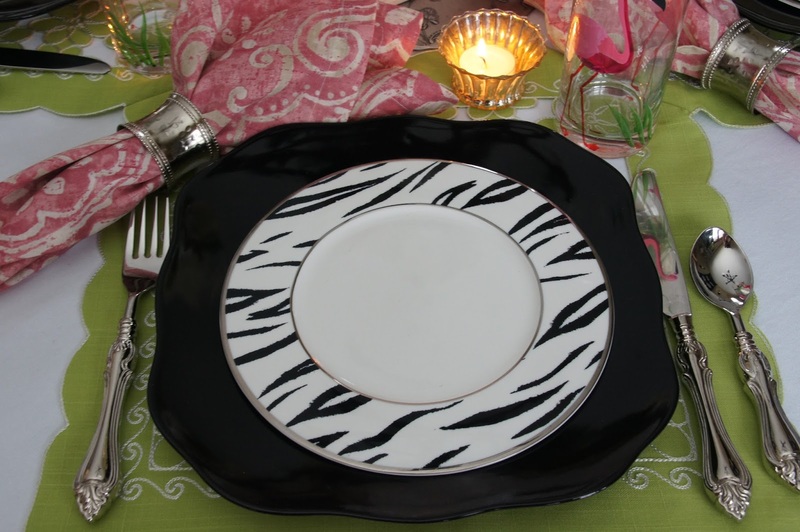 I love the black & white animal print plates with the pink accents. It's a fun table! Liz, this is such a fun table! 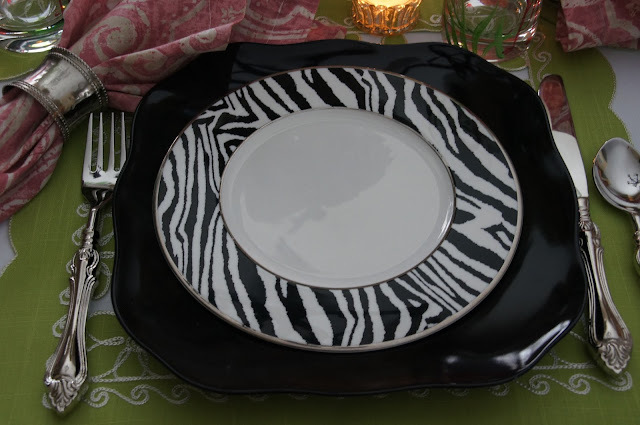 I love those animal print plates!! Liz, I have always loved animal prints and your plates are fabulous! I love the mix of patterns and the pops of color! This is such a fun table in the middle of winter@! Of course, I’ll be shamelessly stealing this combo! Dang, woman...you rocked it! You had me with the elephant! Wild and definitely fun! 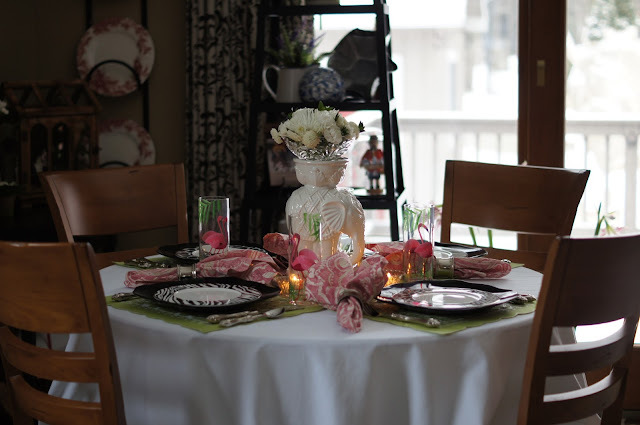 This tablescape would make anyone smile on a dreary winters day! Thanks for sharing with SYC.